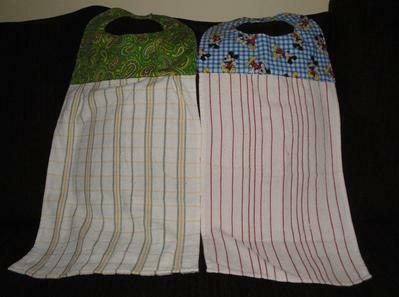 Adult bibs I make for the hospital bazaar. So far I have made about 8 of them. We used a bib that was already made and just went from there. We will be selling them for only $5. Several of the ladies have already picked out the one they want for themselves. I still have to make me one. But will do so soon. Mildred, these are a great way of saying "I care". They will be the perfect item for adults and older children who may need them. Thank you. They are very long because we used the whole tea towel. Could be cut in half and still be a nice bib. Great work you are doing Mildred. They should sell. I was thinking of nighttime drool clothes. Silly idea, and I am still trying to come up with a witty saying. Live Laugh Download Stitch! Thank you. When you come up with the saying please let me know. We probably could use it. Excellent idea. I'm sure they're popular. Thank you. We have already sold several of them.